Behind The Assignment and The Consequence, launched in March and April respectively, comes the last and final DLC for The Evil Within, entitled The Executioner. The first two put you into the shoes of Detective Juli Kidman, showing from his point of view the events of The Evil Within. He had played a much more important role in the history of what appeared in the game that was launched in October last year. The original script left many without tying ropes that were explained in these two contents, and also for not offering more of the same, both The Assignment as The Consequence (especially the first) pushed for a different approach to gameplay of the original title, with more mystery, more puzzles, and some new game mechanics that contributed freshness to the formula. The story without explaining quite right is left and then sell these DLC we did not feel well, but we must recognize that when quality / price ratio, these downloadable paid content is not bad. Although the story in The Consequence closed almost completely, leaving a small door open, and this is explored in The Executioner, who surprisingly puts us in the shoes of one of the enemies of the game, we have to control from a first person perspective. 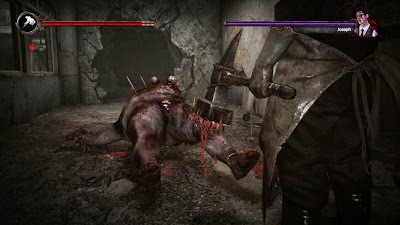 Specifically of The Guardian, one of the heads that tormented us in The Evil Within, that with a safe for head and huge hammer in hand. In order to find our daughter we have to explore the mansion again reminded us of the original Resident Evil, in an adventure much more focused on action than the previous DLC. A game for a change of perspective and downloadable content is surprising in itself, but is also well done, and for instance have decided that this time we play full screen, discarding the black bands generated much debate. We can make two types of melee with the hammer, and also grab and throw objects and enemies. What is this for? As for example to impale an enemy, as the game invites us to be creative in killing. To catch an opponent you must first weaken him, when the option to execute a spectacular action also unlocks. If we attack while running we can make a charge, and the same button to run if we press a direction perform evasive moves. There is the most complete system of combat we've seen, but does not give much time to get bored of it because it is a DLC quite short, which does not even reach two hours. Despite its short duration, have included incentives for us to entertain us more than necessary, as a collectible series as documents, a list of 18 different types of deaths that have to be made, and all the more interesting, progression system that allows us to improve the character and buy new weapons. Enhance the power of the hammer, the movement speed, defense, maximum health, and buy weapons like dynamite, spiked traps, molotov cocktails, chainsaw or even a rocket launcher. To acquire all these improvements have to use coins, which are achieved by overcoming enemies, breaking objects and exploring the environment. The Executioner recycles much of the original game scenarios, but explored from a first-person look new. Exploration is very simple in this adventure, and the challenge is in trying to overcome the different arenas that we face, where you must defeat a boss. Each with its own peculiarities and characteristics, such as firearms, and we have to settle for banging around with the hammer, somewhat complicated if we have not improved the speed of movement. Buy upgrades just doing much needed, and there are optional arenas that serve basically for easy exchange and improve the character. The story telling is going through some documents that we collect through the scenes, and does not have much interest, and fighting is not that they are not very funny, but it does become challenging at times, and invite use resources to our more powerful than brute force. In short this is an entertaining DLC, but not memorable, and its price half the previous DLC, gives us a clue that this is a natural experiment unpretentious. 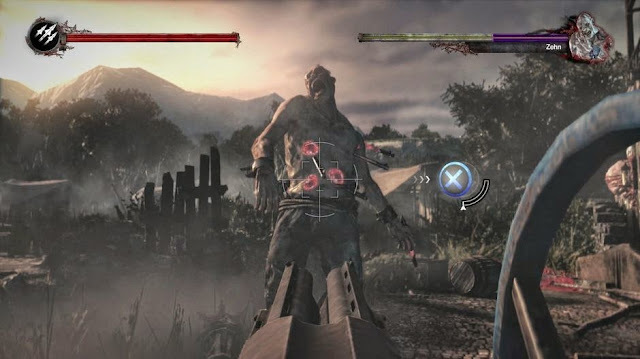 Making and stock of what has been the downloadable content for The Evil Within, if you did with the season pass (especially if it was for a good price) the truth is that this is not bad the quality and quantity of hours of entertainment they have offered, finishing off the story and including new mechanics in each chapter, the latter being the most original episode. Bethesda has once again demonstrated its DLC caring.